It’s up to Chicago detective Sam Mitchell to solve the ongoing serial murders of dozens of Afro-American hairdressers, whose scalped remains are being hung like trophies to their salon mirrors. As a rookie in the late 1970s, Sam covered a grisly crime scene in Harlem, where a Native American woman was murdered and scalped, her baby missing. That case was never solved. Is the troubled Black cop up to the task of restoring order to the city? 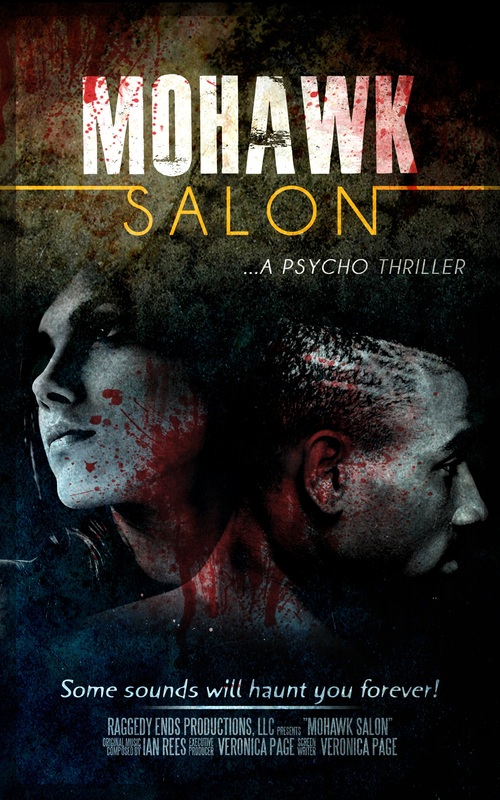 This is the tantalizing tale of “MoHawk Salon,” a psycho thriller from Los Angeles- and New York York-based Raggedy Ends Productions, LLC. The company is continuing fundraising efforts to reach its benchmark of $1.5 million to fund production and bring the full-length movie to 2,000 screens by year-end 2013. Raggedy Ends Productions has taken the unusual tact of raising money in an organic fashion, via its website mohawksalonfilm.com, allowing fans and followers to donate any amount in exchange for their name appearing in the film’s end credits—or for a $50 donation, receiving a glossy 11″x17″ signed by Veronica Page. The campaign was launched in November 2012, with an intended deadline of Fall 2013. Ultimately, “MoHawk Salon” is a story about love crossing the barriers of tradition, culture and ethnicity—set in a tumultuous period in American history—because of the love between an African-American man and a Native American woman. It features some 65 speaking roles, with the film’s trailer available on mohawksalonfilm.com. For more information, contact Veronica Page at info@MoHawkSalonFilm.com.